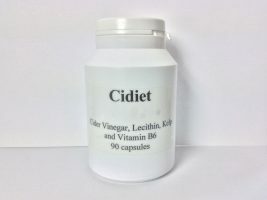 Cidiet contains Apple Cider Vinegar appreciated by slimmers for the role it may play in assisting weight loss, Lecithin which helps to emulsify dietary fat, Kelp a rich source of Iodine helps maintain normal thyroid function and Vitamin B6 involved in the metabolism of protein and lipids. 90 Capsules take 1 - 6 per day. Introductory price £7.80!